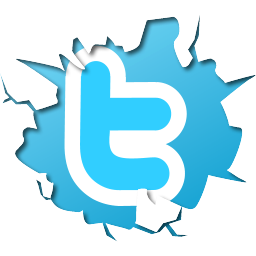 Twitter Applications are nowadays getting created like hundreds and thousands a day. According to this post -> One Million Registered Twitter Apps at their twitter blog back then at 2011, a new app is registered every 1.5 seconds. It is needless to say the amount of apps that would be registered by the end of this year and only you can imagine the limit. And the amount of twitter app developers are increasing day by day. I've been running a nono-coding blog (mostly twitter related tips) and I don't wanna get into any details to coding with this blog, as I've my personal blog where I share some coding experiences. This post will guide you to create (register) a Twitter App in just minutes. If you have a twitter account (I'm sure you do), just sign in with it to twitter developers site. Viola., You've created your developer account. So, create one by clicking on the "Create New App" button. Follow the Instructions and enter the fields that are neccesary. Similarly when adding the callback url, make sure you add the localhost ip address, because it returns error if http://localhost/website/callback.php is entered. only if you don't have a server to host the application. Once you click on the "Create Application" , twitter will generate some keys that you'll be needing when it comes to coding part. You should be using them in integrating the app that you've created with your code to make it up and running with twitter. An important thing to note down is that you can change your access level to the following. Read, Write and Direct Messages - Can read, write both statuses, direct messages. And you can get user details, tweet status, retweet, favorite, do nifty things (not literally) with twitter api. 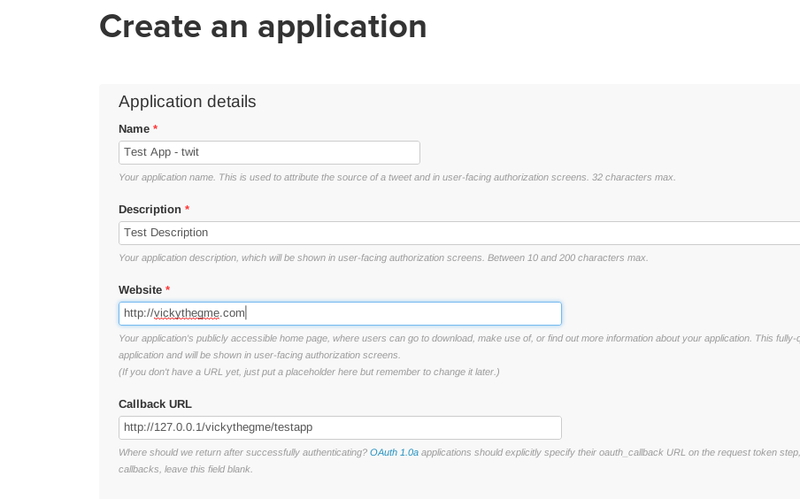 Now you can test your oauth connection with the test Oauth option at the top right side of your app. To know more about the coding parts for the twitter integration with the app that you created just now., checkout my personal blog - vickythegme for the code pieces. Let Us know your difficulties with creating a sample twitter app by following above.